DHA (docosahexaenoic acid) is an essential fatty acid (EFA). EFAs are called “essential” because we must obtain them from diet. DHA is an omega-3 fatty acid commonly found in fish oil. EFAs are necessary for good health, and DHA is a wellknown key to a healthy nervous system. It is the building block of the brain – 60 percent of the brain is fat, and DHA is the most abundant fat in the brain and the retina. It plays a role in the structural development of retinal, neural, and synaptic membranes. DHA is essential in communication between the brain and nervous system. It plays a role in the cell membrane. Without DHA and other fatty acids, communication within this system can break down or become less effective. The body’s ability to synthesize DHA, which is limited in all people, may decline with age. We get some DHA in our diets, but vegetarians might get less. Rich sources of DHA are red meats, animal organs and eggs. Research indicates that low levels of DHA may be involved in a number of health problems relating to the nervous system. A study published in the American Journal of Clinical Nutrition presents research indicating that omega-3 fatty acids, specifically DHA, may reduce the risk of depression. The authors associate the increase in depression in the past century with the decline in consumption of DHA. They also note that there are lower rates of major depression in societies that consume large amounts of fish, a key dietary source of DHA. 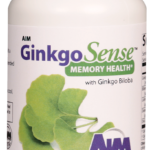 AIM GinkgoSense combines ginkgo biloba, bilberry, lutein, zeaxanthin, and DHA in a synergistic product to maintain your neuro health. Eat a balanced diet low in cholesterol, sodium, saturated fats, and trans fats and rich in whole grains, vegetables, and healthy fats. This is the first step in managing your weight, keeping your blood pressure down, controlling your blood sugar levels, and lowering your cholesterol. Although cholesterol intake from the diet does count, most of the cholesterol in your blood is actually produced by your own liver when you are stressed, so managing your stress levels is very important. Furthermore, regular exercise is extremely beneficial for heart health. The next step is smart supplementation with AIM CellSparc 360, a combination of plant-derived coenzyme Q10 (CoQ10), fish oil, and tocotrienols (vitamin E) for proven cardiovascular support. 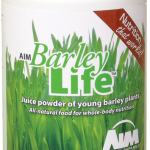 Their synergistic action results in the ultimate heart health supplement to ensure adequate energy production at the cellular level. To produce its cellular energy source, adenosine triphosphate (ATP), the body must have coenzyme Q10 (CoQ10), which is found in cell membranes and in the mitochondria—energy factories of the cells. However, our bodies produce less CoQ10 as we age, so supplementation is crucial. 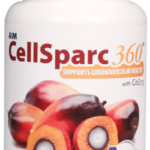 Therefore, CellSparc 360 helps to support and maintain cardiovascular health by providing CoQ10. According to an article in the American Journal of Cardiology, coenzyme Q10 is “an essential cofactor for mitochondrial energy production.” To spark your cells, increase your energy levels, and maintain overall health, supplement with CoQ10. Small amounts of CoQ10 are found in some foods (e.g., spinach, broccoli, some vegetable oils, animal organs, and some types of fish), but it can be reduced or destroyed by cooking or refining. The liver can manufacture CoQ10 but is unable to produce enough if the body is deficient in any essential enzymes or cofactors— such as vitamins B3, B5, B6, B12, C, or folate. Furthermore, stress and pollution deplete CoQ10 from our tissues, and aging makes CoQ10 production even more difficult.